Birds Nests is a simple mod that adds a pseudo-random reward event from chopping trees. Essentially, it's my more realistic take on chance cubes. 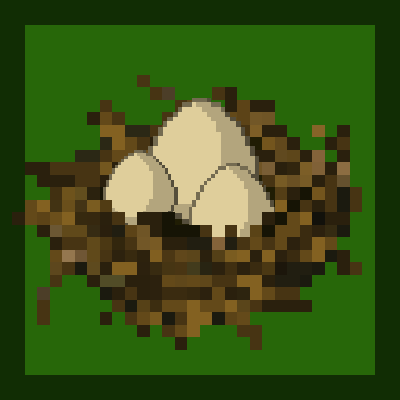 Right click the nest to get what's inside. The possible drops are below from the most to least common and stack sizes show the maximum number of that item possible from a nest by default. Now for Minecraft version 1.12! We've moved over to loot tables! 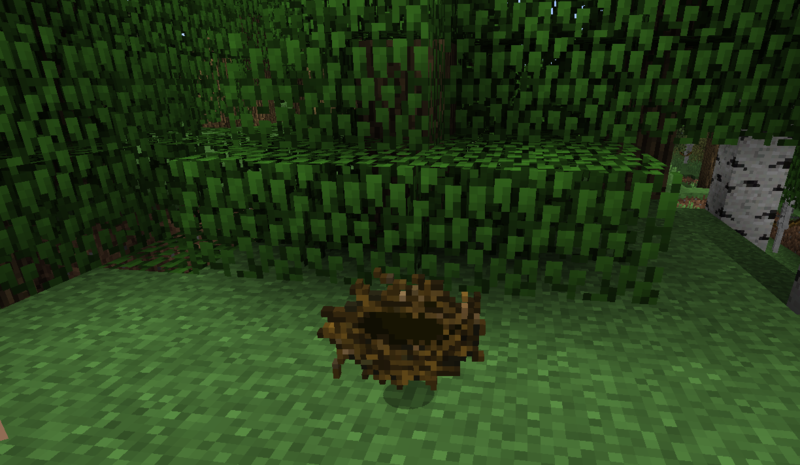 Nest's should drop from any generated leaf block, modded or vanilla. Nests now drop from decaying leaves! However at an 80% drop rate compared to breaking by hand (configurable of course) Leaf decay drops can also be completely disabled. 2) Create a new folder or extract the zip to the "data" folder in the world you want to change drops for. 3) If you downloaded the zip with these folders from here, skip this step. Create the "data\loot_tables\birdsnests" directories and copy from my github or create a new "nest_loot.json" in that folder. 4) Edit the "nest_loot.json" in "data\loot_tables\birdsnests" with your custom loot. *Note that this table replaces the default table so if you want to keep the default items, keep them in the file and add yours to the end. *These loot tables will obviously be on a per- world basis. Sorry if this is a hassle, but it's a restriction by Mojang's code right now. There's a 32x texture pack listed as for Minecraft Version 1.0.0. This is just to prevent conflicts with the curse launcher and works on all versions of Birds Nests. Download if you'd like to. Most versions have 32x textures that can be enabled by config! Can I use Birds Nests in Modpacks? Are you planning on adding the seeds from ex nihilo creatio? Hey there, is there nothing you can do to have a world create the data folder based on a configuration file? Would that not bypass the restriction? Sounds about right, Thanks for the reply! i can use this in my modpack right, buddy? well technic is balls and so is curseforge / twitch so while this mod would have been added to this huge modpack i just spent an entire week just compiling the files and information on the description page it looks like the modpack wont ever be released in the first place, thanks though. Thank You. Sorry for my mistakes and grammar my native language not English unfortunately. Forgive me for not knowing. I'm wondering if there's a way to config the stack size of the bird nests so unlike tools taking a slot for each one you (Say Swords). I can have 64 bird nests per slot like blocks. It looks like there is no reasonable way I can make them drop from bonsai trees, sorry.